Maintenance-free Rulon disc drag with low start-up resistence. Backlash-free, instant drag reaction from a one-way roller clutch bearing. Lightweight, hybrid "skeletor" design - balances new, lighter rods. Dialable, positive position, easy-set drag knob. Better fish tracking from an incoming/outgoing click. Faster line pickup from the large-arbor spool. Several years ago was the last time I put my vest on. Why? Because it was overloaded with everything but the kitchen sink, countless fly boxes, old fishing licenses, leaders/tippets by the bulk, smashed beer cans, litter and some pockets I was afraid to open because of the stains and unusual smell. Relate? While I may not be the most organized person I thought this is BS and there must be another way. Yes there is, and the answer did not come from the book but rather from spending years out in the field guiding. Each fish required specialized tackle and flies, having all your gear thrown in a vest was confusing. Solution: Fly Satchels. 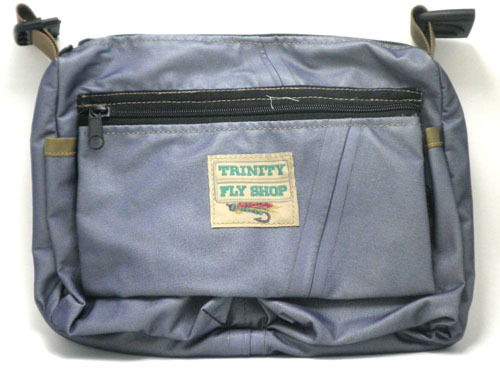 Years ago we designed a simple, yet attractive modest sized fly satchel, Trinity Fly Shop logo and all, to carry our gear. Satchels are simply designed, supporting 5 pockets (3 zipped) of various sizes for easy access and inventory of most everything needed for a specific quarry. Our satchels comfortably fit three positions - over the shoulder or chest pack (out of the way of casting and deep water wading) and the detachable strap may be worn as a belt, and the satchel can be worn around the waist. 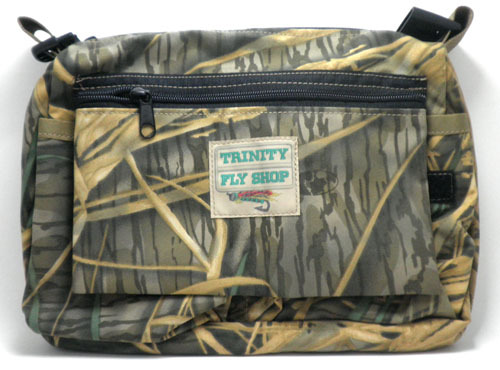 The satchels are color coded (camo-blue-tan) for easy identification. One color represents specific fish or type fishing. Then select whichever one suits your needs. 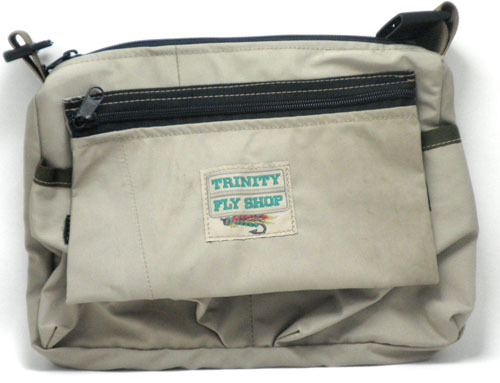 Trinity Fly Shop Satchels are a great bang for the buck. Cost: only $29.95 each. Purchasing 2-3 is the cost of a single vest, with considerably more organized inventory. Fly satchels may not be the answer for everyone; however, we have enjoyed them for years and are simply lost or confused without them! You can find these on our Online Store. 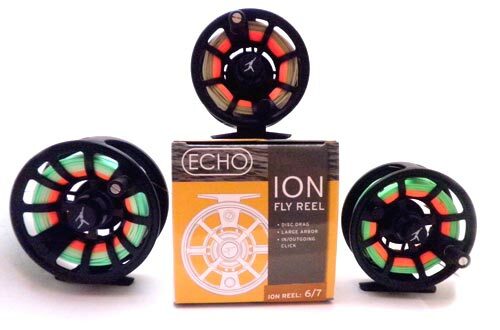 Rods, reels, fly line, backing, waders - so many fly selections, so many cast techniques - when and where to go? 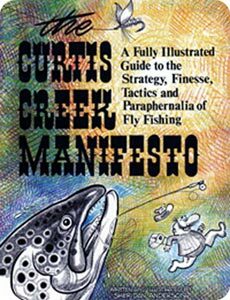 Just how does one began to get started fly fishing? We constantly hear that question. Certainly it may seem overwhelming at first; however, if would-be fly fishers keep the learning curve simple, they'll greatly realize "learning how to fly fish" is much easier than anticipated. There are several ways to help get started. Local fly shops are a wealth of information, and generally offer "crash courses." Further, there is no better way to learn than suiting up and getting in the water. Fly Clubs have been established throughout the state (generally each county supports a local club). Clubs offer monthly meetings, crash courses in fly fishing and tying - field outings, guest speakers and programs. Members are generally very willing to help those wanting to get their feet wet and stretch a line. Of course there are also internet sites, videos, and TV programs that offer informative fly fishing programs.